Mumbai, July 26, 2014 : State Bank of India (SBI), India’s largest bank is determined to bring joy to the lives of new-age Indian consumers with a first-of-its-kind and hassle-free digital banking experience. The smart sbiINTOUCH weekend fiesta aimed at helping India’s youth achieved their dreams, kick-started in Mumbai, the city of dreams, with the ‘sbiINTOUCH Weekend Fiesta’ The Mumbai Weekend Fiesta, first in a series spread across six cities that are Delhi, Kolkata, Bangalore and Ahmedabad, is SBI’s pioneering initiative to present an ultra modern digital way of banking for young and tech-savvy consumers. 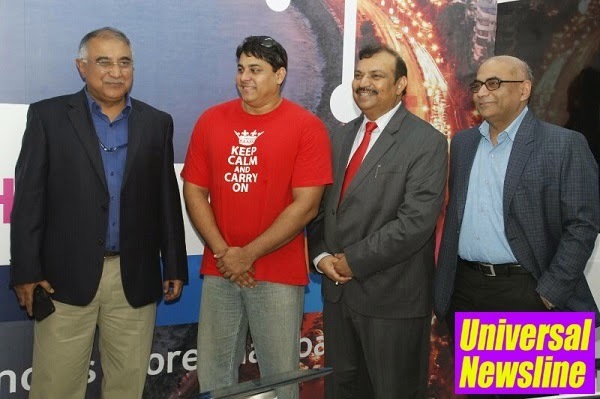 The weekend fiesta proved to be an ultra-engaging occasion where Cyrus Broacha explored the dream world of sbiINTOUCH. He was mesmerised when otherwise lengthy processes like opening a bank account took exactly 5 minutes. After an instant account opening, it was Cyrus’s turn to get his debit card issued. Just when he thought it will arrive at his postal address in 10 days, he saw the sbiINTOUCH associate hand over Cyrus’s personalised debit card within 10 minutes. Cyrus was speechless! But at the sbiINTOUCH Weekend Fiesta, there was more to impress Cyrus. An interactive dream wall at sbiINTOUCH store granted Cyrus’ wish to buy his dream car with an instant in-principle loan approval packed with some expert advice from a remote expert on the best way to plan his finances. Cyrus, who never fails to charm everyone with his wisecracks was charmed himself with sbiINTOUCH’s interface. He went on to congratulate dignitaries present at the occasion, Mr SK Mishra, Deputy Managing Director, CS & NB, SBI, Mr. Sudhir Dubey, CGM (Mumbai Circle) and Mr Prashant Kumar CGM (Network 1 Mumbai Circle) on this exciting initiative. Students from engineering and IIT colleges also joined us from VJTI and IIT college of Mumbai to interact with the dignitaries and get an exposure of this new technology. The GenY of Mumbai thrives on its dreams in this ‘city of dreams’ and is always hard-pressed for time. Keeping this in mind, sbiINTOUCH created an offering that enables every special dream. From taking a loan for a dream home to loan for the next car one aspires for, SBI’s state-of-the-art digital stores have an instant solution to otherwise lengthy banking procedures. sbiINTOUCH stores make every banking transaction as easy and enjoyable as shopping. The stores are strategically located inside malls or high-street shopping destinations in Delhi, Mumbai, Bangalore, Chennai and Ahmedabad. sbiINTOUCH weekend fiesta is being organised to introduce this ultra modern digital platform to the young generation of this country. The fiesta aims at allowing people to dream for their home or vehicle and sbiINTOUCH facilitates them to fulfil their dreams. #intouchweekends continue tomorrow in Mumbai and will be held across the six cities of Ahmedabad, Bangalore, Chennai, Delhi, and Kolkata besides Mumbai.